CANTON, MA (August 11, 2015) – Iced tea servings peak during summer months*, and this week Dunkin’ Donuts is giving fans a chance to keep cool and refreshed into next summer by winning free iced tea for a year. Dunkin’ Donuts today unveiled a fun “Iced Personali-TEA” interactive infographic allowing fans to discover personality traits associated with their favorite way to enjoy iced tea. 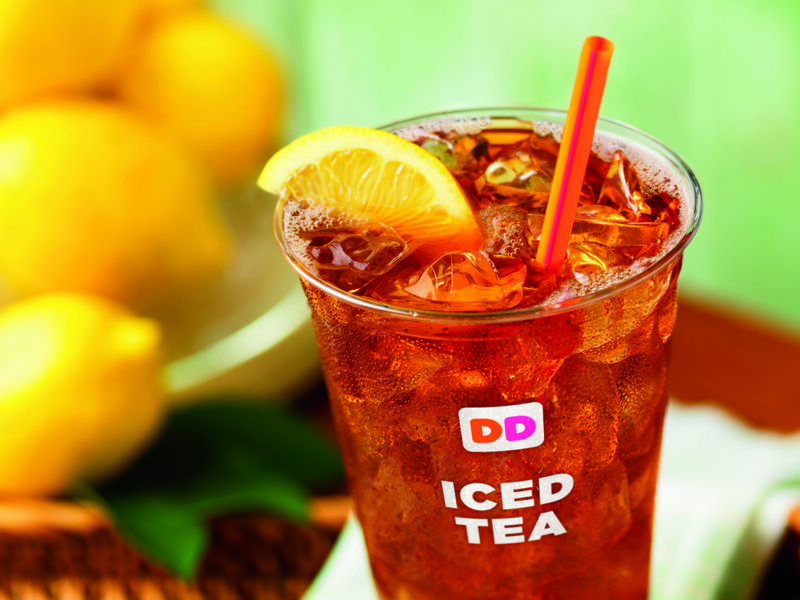 Now through August 14, people who share their own specific Iced Personali-TEA on Twitter using the special hashtag #DDIcedTeaSweeps are eligible to win a grand prize of a year’s supply of Dunkin’ Donuts Iced Tea. Dunkin’ Donuts turned to Juliet A. Boghossian, behavioral food expert and founder of Food-ology, You are How you Eat®, to provide the personality traits related to favorite ways guests can enjoy iced tea. For example, a person with a preference for Unsweetened Iced Tea is “The Disciplined Realist,” an ambitious, driven and practical leader who revels in fast-paced environments. Fans can find the Iced Personali-TEA interactive infographic via Dunkin’ Donuts’ official Facebook and Twitter feeds, as well as www.DDIcedPersonali-TEA.com/quiz. For official rules and additional information related to the Dunkin’ Donuts Iced Personali-TEA Sweepstakes, visit http://dun.kn/1J60kXp. No purchase necessary, 18+ to enter. An increasingly popular choice for guests seeking a better-for-you beverage option for keeping refreshed throughout the day, Dunkin’ Donuts’ freshly-brewed Iced Teas are made-to-order, unsweetened or sweetened, and available in a fruity variety of flavors including Blueberry, Raspberry and Peach. With five calories per 16 ounce serving, a small Dunkin' Donuts Unsweetened Iced Tea offers a crisp, cold and convenient way to quench any thirst. To help guests stay cool through summer, Dunkin’ Donuts also offers several regional iced tea options, available only at participating Dunkin’ Donuts restaurants in select markets throughout the country. For example, in the Southeast region Dunkin’ Donuts offers Sweet Tea and Sweet Tea Lemonade. Dunkin’ Donuts Sweet Tea features Dunkin’ Donuts’ Iced Tea with a sweet twist for authentic Southern-style refreshment. Dunkin’ Donuts combines this beverage with delicious lemonade to create its Sweet Tea Lemonade beverage. In the Northeast, New York City and Chicago regions, Dunkin’ Donuts offers guests Iced Green Tea, containing 30% tea sourced from Rainforest Alliance Certified™ farms that are managed according to rigorous environmental, social and economic criteria. Food-ology is an original methodology founded by behavioral food expert and researcher, Juliet A. Boghossian. Based on over 20 years of empirical research combined with quantitative panel data Food-ology links food related habits to personality traits and behavioral tendencies. Insights offer a portal into one’s character. A means to learn more about yourself and those around you to support better judgment, improve relationships, increase effectiveness and empower your life. For more information, www.food-ology.com.